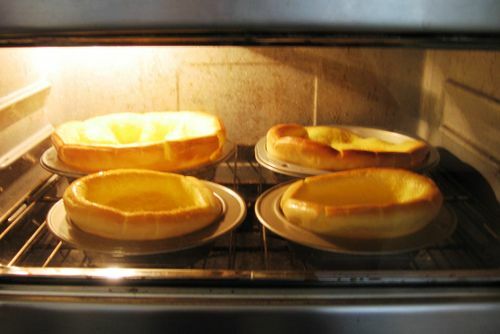 Holiday Gatherings, 2008: "German Pancakes" - Thurburn's Specialty! "German Pancakes" - Thurburn's Specialty! Before Christmas, Thurburn Barker sent a greeting with this happy news: "Our daughter, Janet, and her family from Pennsylvania are with us in Hendersonville for Christmas. Our other daughter, Heather, and her husband live in Hendersonville; so, our immediate family will be together for Christmas for the first time in over a decade. I encouraged him to be sure to send some photos for the blog. After Christmas, Thurburn did so, with this explanation: "I didn't take an avalanche of photos this year. Robert, my son-in-law, took most of the photos. Unfortunately, I forgot to download them into my computer before they left. I'll be sure to get a copy of them when we make a trip up to New Hope, PA, later this month. However, of the few photos that I did take, I've included 3 or 4 with this email." He sent this photo, with the following explanation: "The German Pancakes photo shows four baked pancakes (my specialty). This batch was made from 8-eggs, 1/2 cup of flour (it's better to use a little bit of Gluten flour to stiffen the upright walls after baking), 1/2 cup milk; baked for 12-15 minutes at 450-degrees. After baking, they are filled with steamed apples slices followed by a bit of lemon juice, maple syrup, cinnamon and dusted with powered sugar. Yummy. A few months ago, I taught Landon how to make these. Now this is his specialty and he enjoys making these for his family and friends. The Village Inn Pancake House used to have these on their menu in the Boulder and Denver area. However, the Village Inn dropped this item from their menu sometime in the 70's; I suppose that's because it took 20-minutes to prepare and was a bit more complex in presentation." Karla's note: Aren't these beautiful!?!?!? YUM!!! This is also one of Ed's specialties - although we call them Dutch Baby Pancakes. Birds of a feather!! !